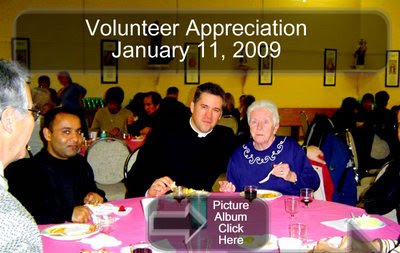 Volunteer Appreciation: It was very meaningful to have this event on 11th January 09- Feast of Our Lord's Baptism. In the gospel we heard the Father appreciating His Son Jesus "This is my beloved Son with whom I am well pleased"
So also through and with Jesus all volunteers in the parish were appreciated not only for what they do but for who they are. We too appreciate the services given to us by our Pastor Fr. Marc-Andre Campbell and Associate Fr. Ed Curtis.